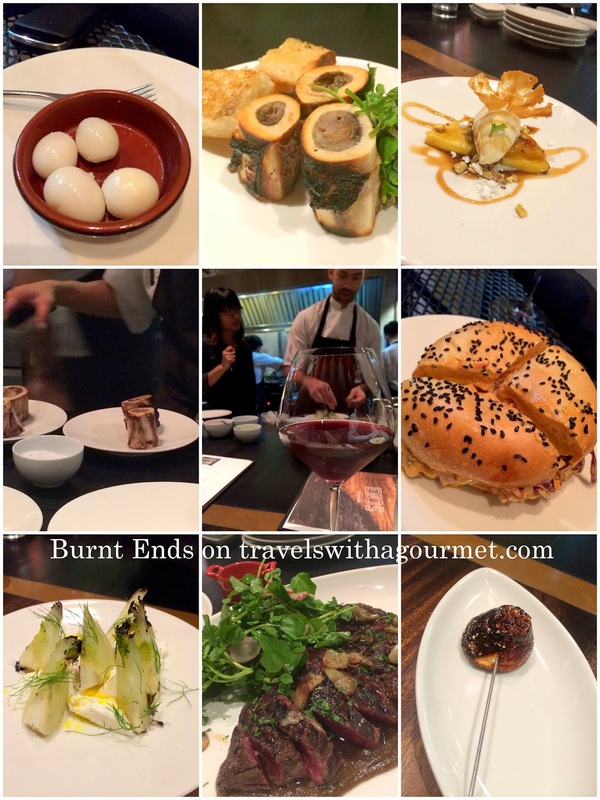 One of the first restaurants we tried when we arrived in Singapore was Burnt Ends – a relatively new addition to the Singapore restaurant scene headed by the young Australian chef Dave Pynt. Here, it’s all about the barbequing with everything on the menu from the starters to the desserts cooked either on the wood-fire grill or inside the custom-built wood-fired ovens that take up most of the narrow room. Seating is on a long low counter facing the open kitchens or on the bar counter lining the wall. There is also a chef’s table for six to eight diners towards the far end which can be reserved with a set menu. Since they only take reservations for the first seating at 6:30 which was way too early for us to eat, we met up with our friend M at around 8 and waited it out with a couple of glasses of wine at one of the bar counters. It was a full house that evening so when we finally sat down to eat around an hour later, we were ravenous and had already checked out that day’s menu (which changes daily depending on what the chef has available). On that evening, the menu listed four little bites, about half a dozen appetizers, two fish (both of which were finished by the time we sat down) and five meat dishes. We started out with the smoked quail eggs. The smoked quail eggs were soft-boiled and served as is – a bite of salty, smoky with the yolk oozing out. Next up was the the signature Burnt Ends’ Sanger (pulled pork shoulder, cole slaw, Chipotle aioli on a brioche bun) – an overstuffed sandwich of tender pulled pork on a soft bun. This was followed by the bone marrow and pickled walnut served with toasted country bread – a mouthful of delectable melt-in-your-mouth hot bone marrow on crispy bread. Next up was the main course but since everything is cooked to order on either the grill or the oven, it was going to take awhile before we got served. While waiting, we decided to order one of the other small plates – fennel with orange and Burrata – which was lightly grilled just to color the edges and served lukewarm with the super creamy fresh mozzarella, an interesting mix of the anise-flavoured vegetable with the soft cheese. Finally, our main course was served – the flank steak, grilled medium rare and served with a side of crisp butter head lettuce with just a touch of shallot vinaigrette and it was worth the wait. The meat was charred on the outside, yet tender and rare on the inside and the small salad was a refreshing side dish to the steak. Last but not least was the pineapple rum and vanilla dessert, the fruit grilled till caramelized then topped with a dollop of vanilla ice cream – hot and cold at the same time. To finish off, the chef offered each of us roasted marshmallow on a skewer – a playfully sticky end to our delicious dinner. *Bookings for dinner only for first seating at 6:00 and 6:30 p.m.